Home security is a priority for many. And with a vast range of products to choose from, you’re probably wondering what’s considered high quality, what brands to consider and, most importantly, what will be friendly on your budget. 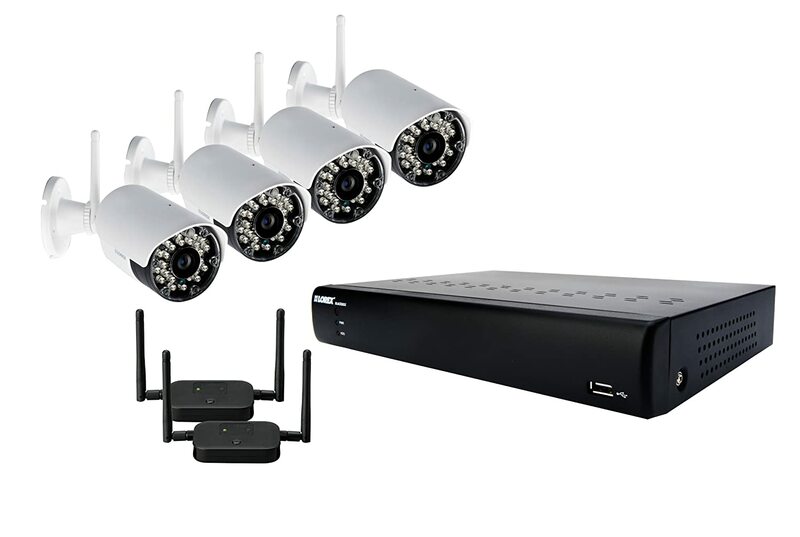 Both budget-friendly and advanced in technology, the Lorex 4-Channel 500 GB Digital Video Recorder gives you the freedom to security cameras anywhere you want. This is a home security device you can depend on, designed with convenience and efficiency in mind. When monitoring your home security system feeds, you probably want the ability to access it regardless of where you are. Perhaps you want to keep an eye on that new pet of yours to make sure he’s staying out of trouble. Easily control your device right from the comfort of your computer. The connection is reliable and can save you a lot of time with reliable alert email notifications, which are accompanied with a screenshot. The Lorex is compatible with all major mobile platforms, including Androids, iPhones, BlackBerry phones and tablets. It can even support some iPhone models. This means that you have the ability to access your system’s live feed remotely, regardless of where you are. You can do this by downloading the free applications Lorex has to offer in both the Apple and Windows mobile store. No more worrying about your home while away on vacation. 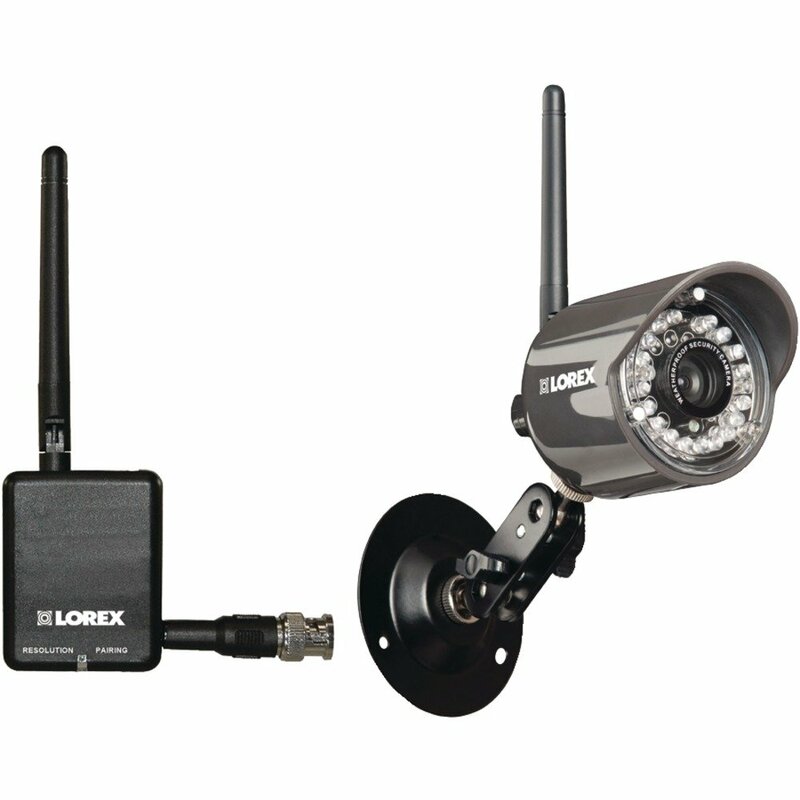 The Lorex is built for indoor and outdoor surveillance. If you’re planning on setting up your cameras outside, you won’t have to worry about water or heat damage. The Lorex is capable of withstanding the elements and will remain function and intact while outside. You know the frustration: trying to install something and struggling to strategically place all the wires so that they’re hidden and out of the way. You won’t have to when installing the Lorex 4-Channel Digital Recorder. 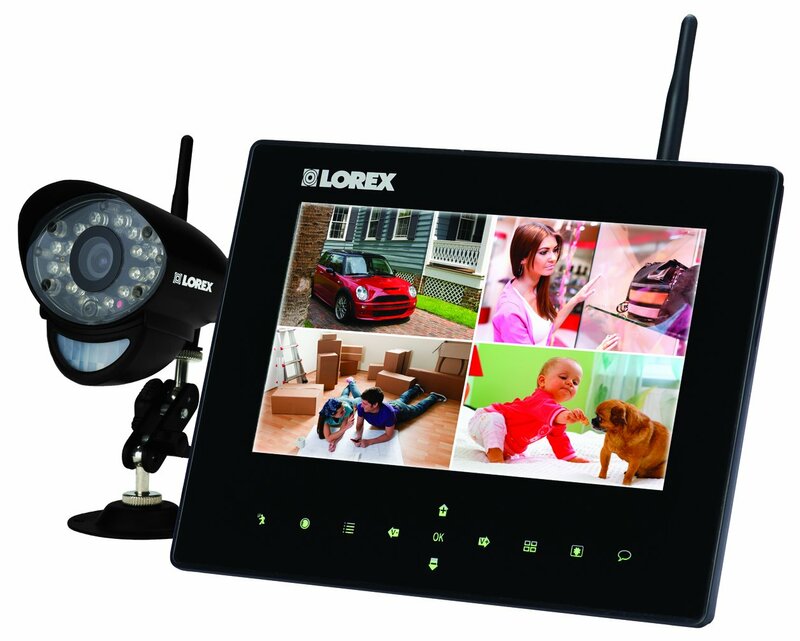 Because the cameras are wireless, you can easily set up your home security system clutter-free. It also keeps the area of installation safe, as there won’t be any exposed or hanging wires that your kids and pets can get to. This also provides you with a very flexible device, able to move it to a different location depending on your needs. Additionally, its Signal Guard technology guarantees a stable connection that’s reliable and isn’t conflicted by other signals. With the Lorex Digital Recorder Kit, you’ll be provided with 3 video outputs, which can be viewed on multiple monitors at the same time. This is especially ideal for business applications, as you’ll most likely have the DVR placed in a back office or in an area that can be viewed publicly. And it’s all recorded with zero interruptions. The Lorex is capable of resolution adjustment, with a 640×480 resolution at 12 frames per second for high quality video or a 320×240 resolution at 30 frames per second, suitable for live streaming. With the addition of SafeGuard technology, you won’t have to worry if the connection to your camera will be lost. SafeGuard is capable of monitoring your wireless signal, automatically reconnecting if a low signal is detected. No more dropped connections interfering with your camera’s recording schedule. With a pre-installed 500 GB hard drive, you’ll be able to continuously record for weeks, which is done by using motion-activated recording. This means that you’ll have a home security solution that’s reliable all day and all week. And the addition of time stamps to your live feed will make all of your recordings easy to find. The security system comes with its own exclusive Internet setup. This ensures that the connection is secure and consistently capable of delivering your email notifications, which are sent to either your computer or mobile device. The Lorex 4-Channel Digital Recorder has an average consumer rating of 4 stars. You can purchase this home security system for around $500 to $700, depending on where you purchase it from. This home security system allows you live feed access via Skype so you can check in from anywhere in the world. It’s capable of dual-motion (heat sensors and video motion) detection and pre-event recording. The price for this model is around $399. 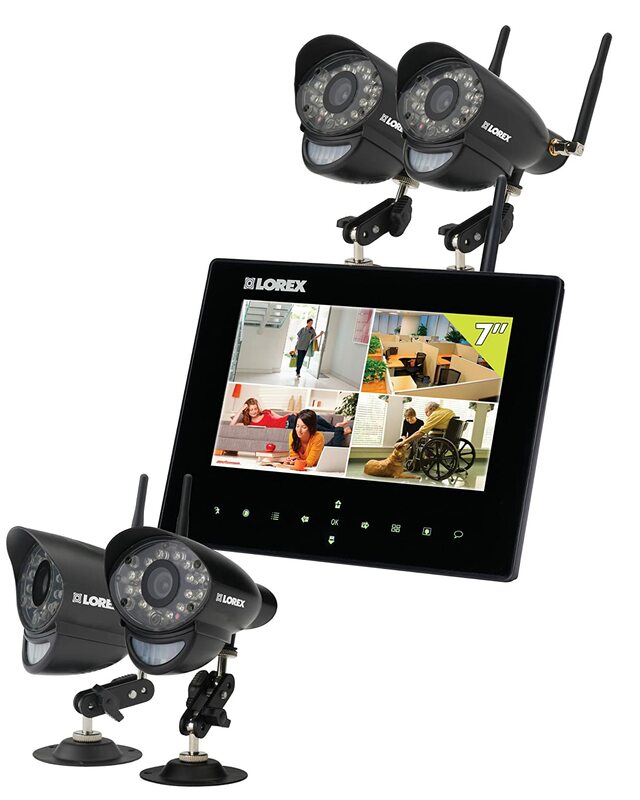 The Lorex LCD Recording Monitor has up to 3 recording modes, night viewing, and an integrated video recorder which can hold up to 32 GB of recorded storage. You can find it at the link below starting at $205. 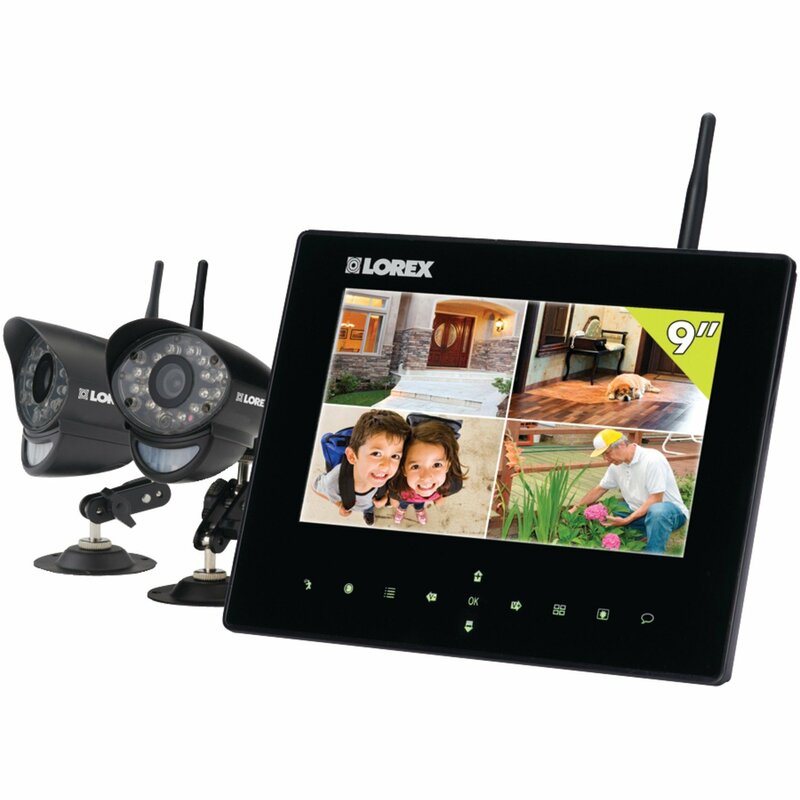 This Lorex home security system provides multiple recording options (manual, motion and scheduled) and features a clear, 9″ monitor with touch-screen capabilities. A good alternative that has a list price of under $400. A much smaller alternative, this wireless digital security camera can connect to multiple receivers with a high-gain antennae and a 640×480 pixel resolution. This would be more ideal for a small apartment, or a studio. It doesn’t take up a lot of space unlike other models. This can be purchased for under $90.